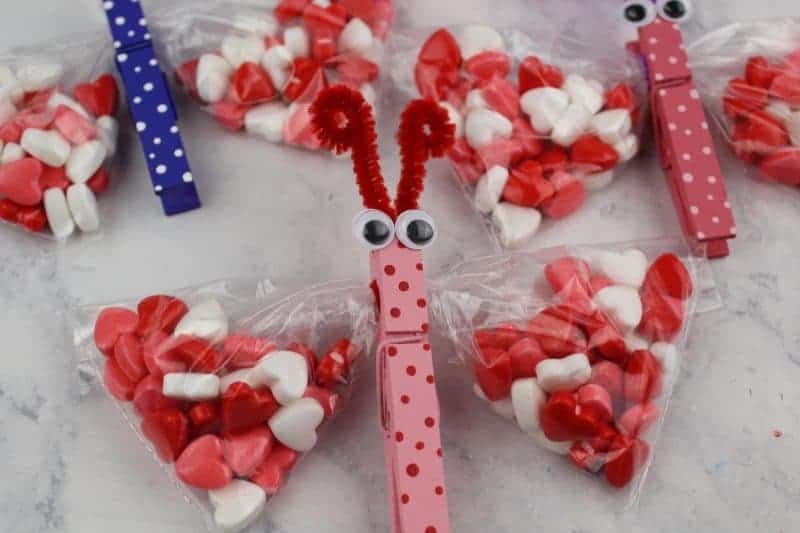 Butterfly snack bags are a fun and easy to make snack for kids. 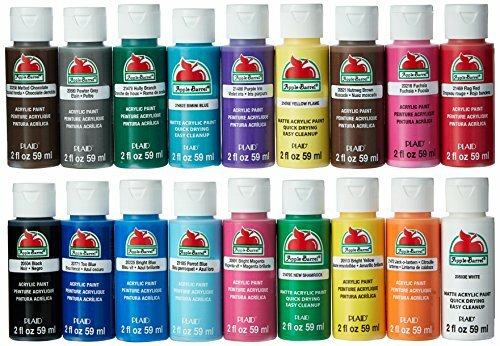 They can be filled with everything from candy to fruit so that they can be as healthy or an indulging as you would like! 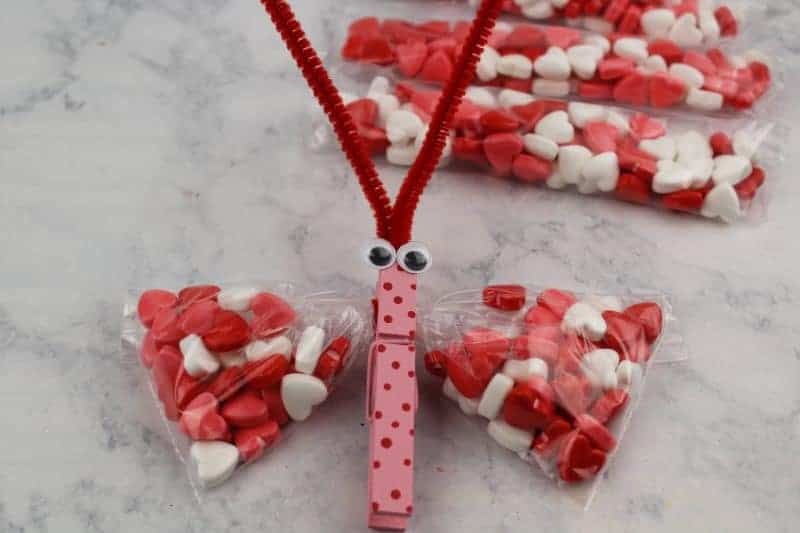 If you are looking for a fun homemade treat to hand out to your child's class, these butterfly snack bags made with clothespins and, pipe cleaners, googly eyes and baggies will be perfect. 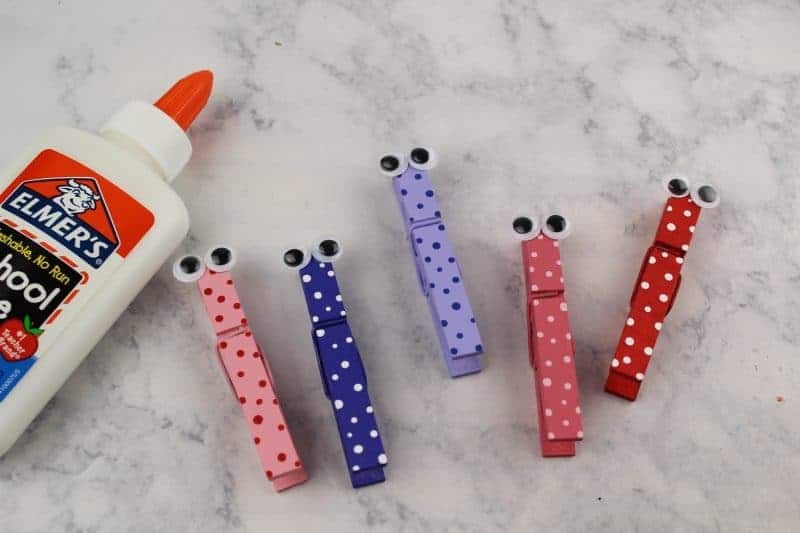 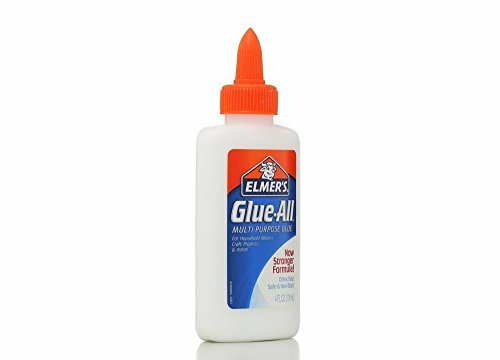 They are inexpensive and easy to make, and oh so stinkin' cute! 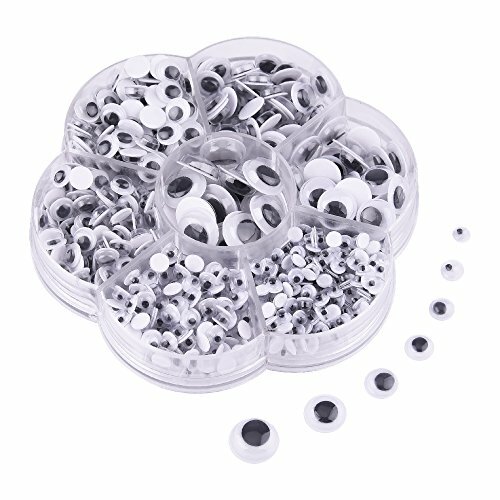 The kids will be sure to get a kick out of them, and enjoy the snack inside. 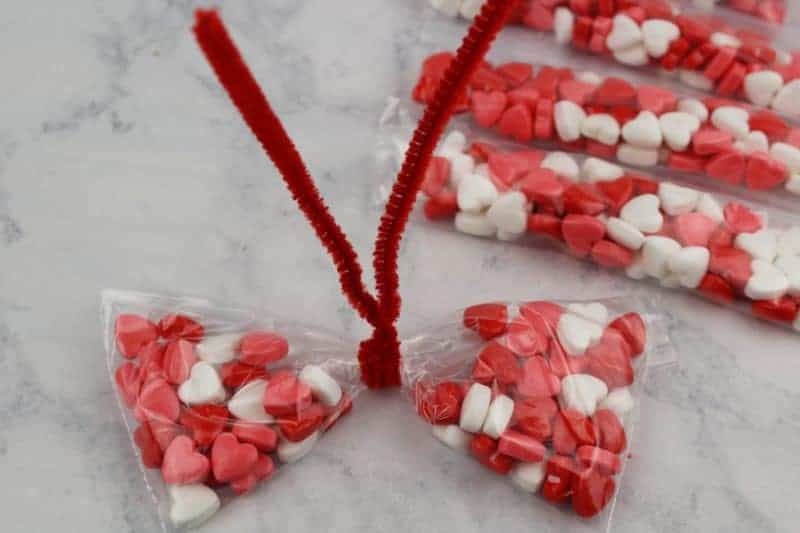 We made these butterfly snack bags for Valentine's Day, so as you will see they are red are packed with heart candy (that we picked up at the Dollar Tree). 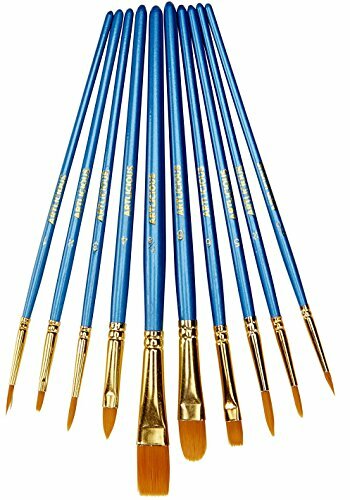 Of course you can style them in whatever color pattern you find will work best for your occasion. 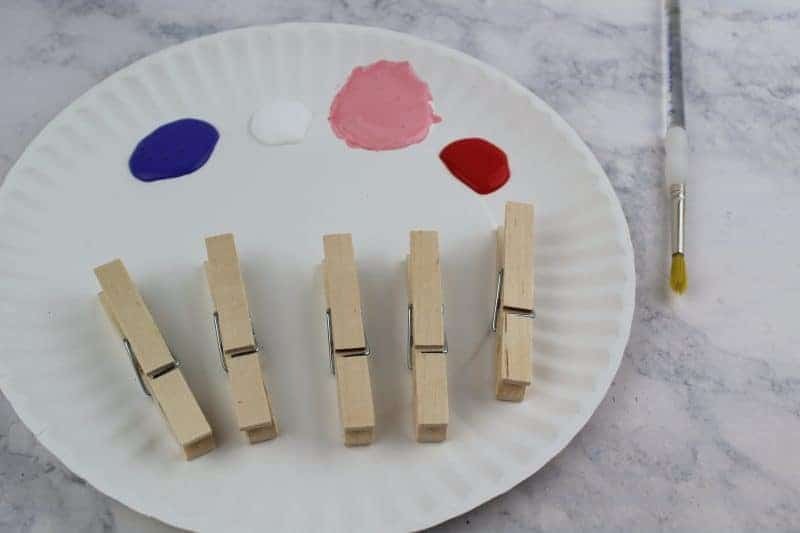 These are a great spring craft so using pastels would be great too. 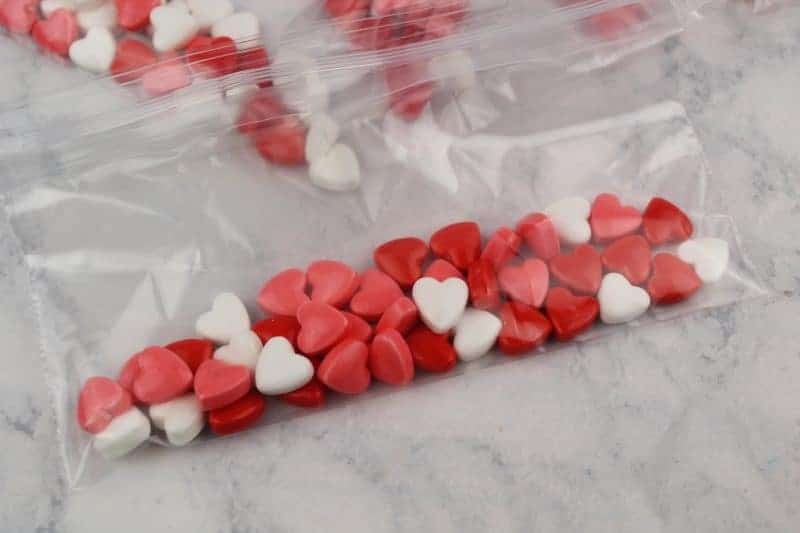 We used candy hearts as the treat inside the baggies, but if you wanted to make this a healthy snack for the kids you could easily fill the baggies with raisins, grapes, crackers or cereal instead. 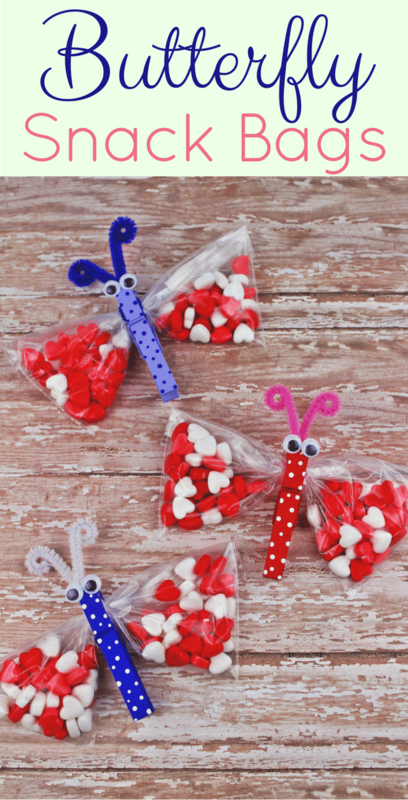 You can even have your toddler or preschooler help to make this easy snack for kids. 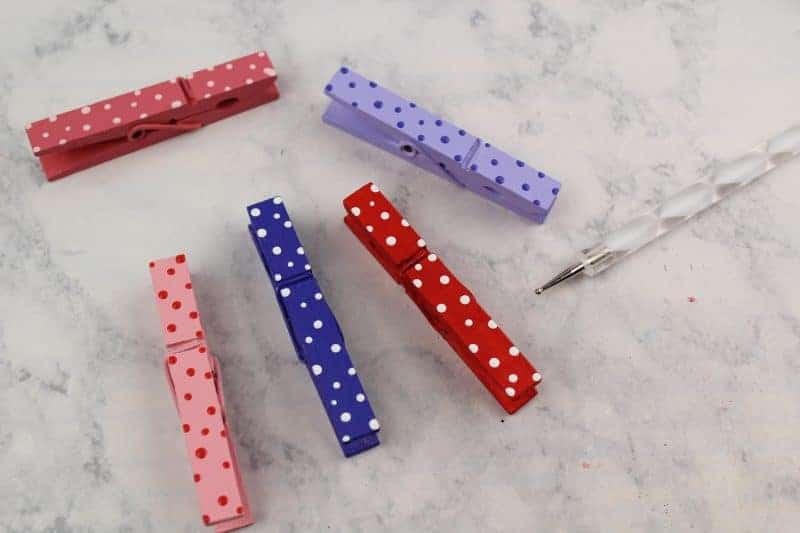 Their little fingers would be great for filling the treat baggies or for painting the clothespins. 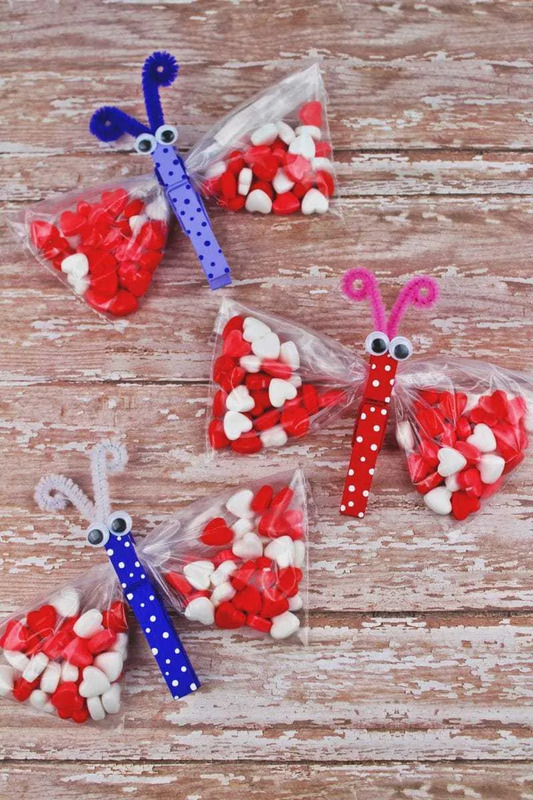 However you decide to make these butterfly snack bags, and whatever you choose to fill them with, one thing is for sure. 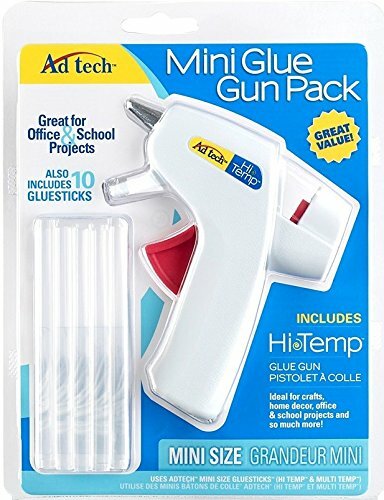 The kids will love them! 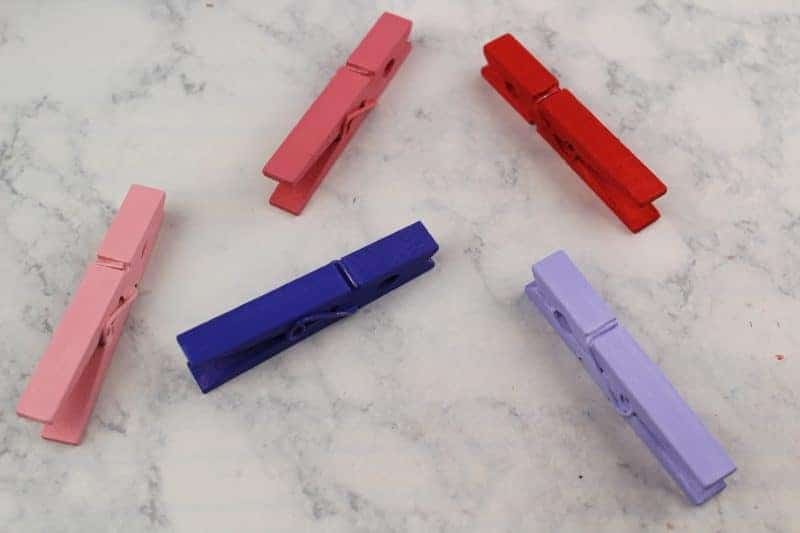 Paint the clothespins shades of red, pink and purple (or whichever colors you choose). 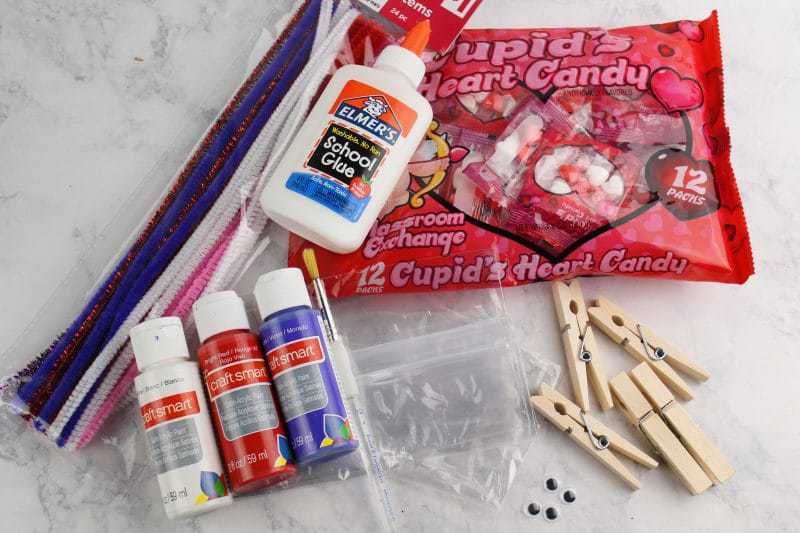 While the glue dries, fill snack sized ziploc bags with candy hearts or other treats. 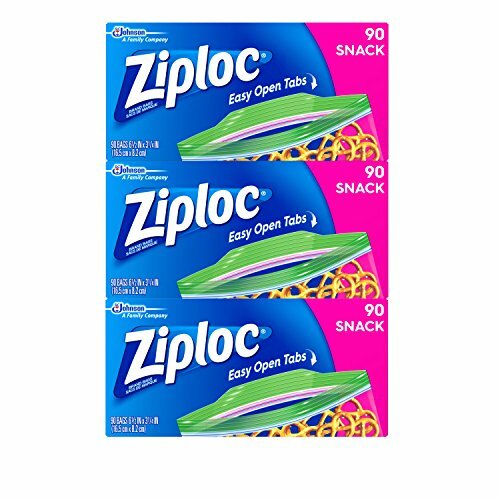 Then, wrap a pipe cleaner evenly around the middle of the bag. 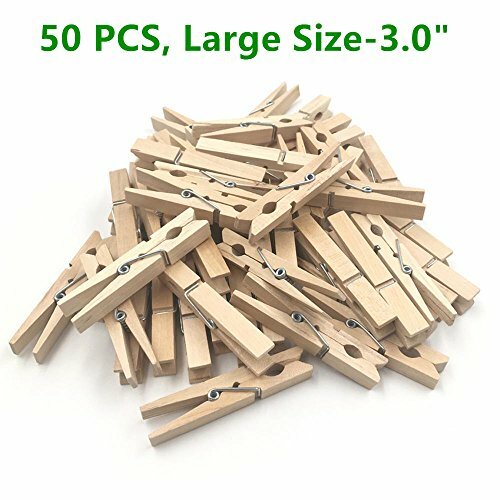 Twist a few times to keep it from coming undone. 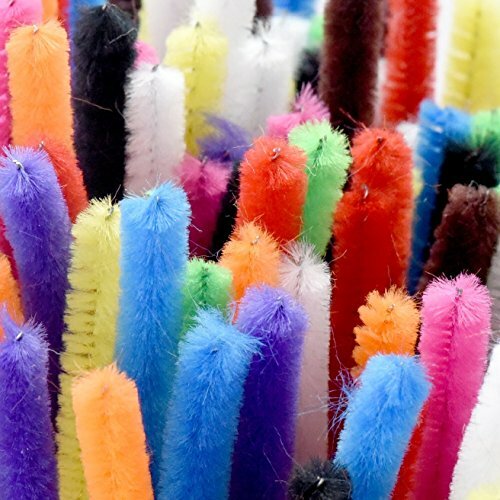 Trim your pipe cleaners and then twist into a swirl to form the butterfly’s antennae. 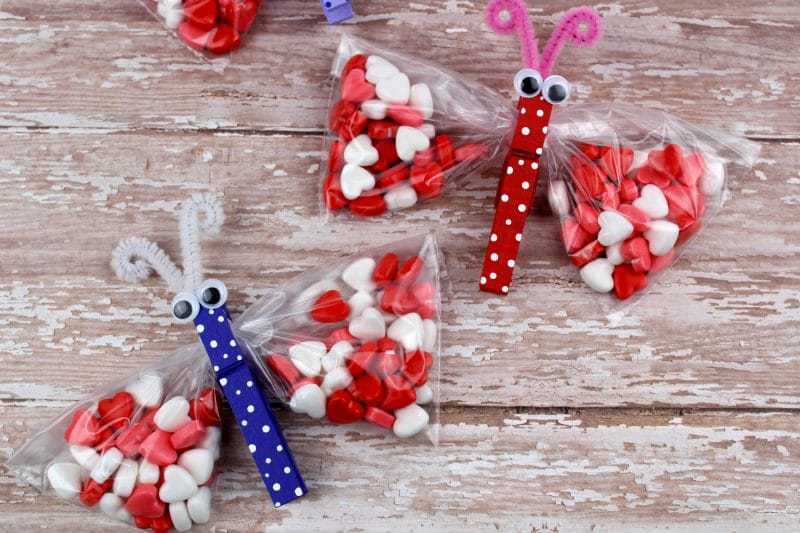 Your butterfly snack treat bags are finished and ready to be enjoyed!